David Zeigler was born Johann David Zeigler or Ziegler on July 13, 1748, in Heidelberg, Germany, the son of Johann Heinrich Zeigler and Louise Friederika Kern. He served in the armies of Friedrich der Grosse of Prussia and Catherine the Great of Russia before immigrating to the American colonies about 1774 or 1775. David settled in Carlisle, Pennsylvania, and after the Battle of Lexington in 1775, he joined William Thompson’s Pennsylvania Rifle Battalion. In 1776, Thompson’s regiment was reorganized as the First Regiment, Continental Infantry, and David was commissioned a second lieutenant. He participated in many battles, including the Battle of Long Island (August 27, 1776), in which he was wounded. In 1778, David was promoted to captain in the First Pennsylvania Regiment. He was mustered out of the army in 1783 and returned to Carlisle, where he opened a grocery store. 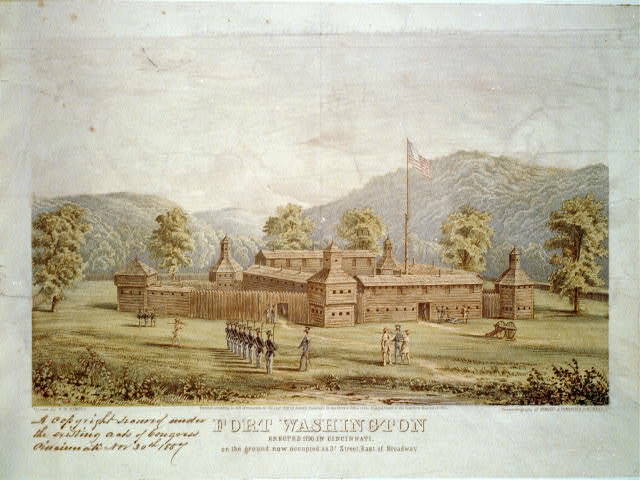 In 1784, David was appointed a captain in the regular army under Josiah Harmar, and from 1784 to 1790, he served at several forts on the frontier, including Fort Washington at Cincinnati. He participated in the protection of federal surveyors and the negotiation of treaties with Native Americans. David was promoted to major in 1790. He was with Arthur St. Clair at his defeat in 1791, and David was left in charge of Fort Washington when St. Clair returned east. David resigned from the army in March 1792. On February 22, 1789, at Fort Harmar in Marietta, Ohio, David Zeigler married Lucy Anne Sheffield. Lucy Anne, often called Lucianna, was born December 22, 1761, in Jamestown, Rhode Island, a daughter of Benjamin and Hannah Sheffield. Two other children of Benjamin and Hannah Sheffield were: Phebe Sheffield (1754-? ), who married Charles Greene (1753-? ), and Mary Sheffield (1757-? ), who married Isaac Peirce (1749-1821). Therefore, the following individuals were included among the nieces and nephews of David and Lucianna Zeigler: Joseph Peirce, Phebe (Peirce) Steele (and by extension James Steele), Charles Russell Greene, Sophia (Greene) Burnet Cooper Loury (and by extension Daniel C. Cooper). David and Lucianna Zeigler did not have any surviving children of their own. After his retirement from the army in 1792, David Zeigler purchased and farmed a piece of land about four miles from downtown Cincinnati. Then, in 1797, he sold the farm to John Smith and removed downtown, opening a store on Front Street, east of Sycamore. Also in 1797, he was appointed the Supervisor of Cincinnati Township Highways. Cincinnati was incorporated in 1802, and at that time David Zeigler was elected as the president of the town council and chief magistrate, making him effectively the first mayor of Cincinnati. He served two terms in that capacity and might have served a third, but he declined the position in 1804. In 1803, President Thomas Jefferson appointed David as first Marshal of the Ohio District. David served as Adjutant General of Ohio in 1807. And in 1809, he was made Surveyor of the Port of Cincinnati and served in that capacity until his death. David Zeigler died on September 24, 1811, in Cincinnati, Ohio. After his death, his wife Lucianna removed to Dayton to be near her nieces and nephews in the Peirce, Steele, and Greene families. Lucy Anne (Sheffield) Zeigler died November 18, 1820, in Dayton, Ohio. The remains of both David and Lucianna Zeigler were eventually buried together in Woodland Cemetery in Dayton. George A. Katzenberger, Major David Ziegler (Columbus, OH: The F. J. Heer Printing Co., 1912), 4-5; Don Heinrich Tolzmann, The First Mayor of Cincinnati: George A. Katzenberger’s Biography of Major David Ziegler (Lanham, MD: University Press of America, 1990), xiii, 55-56; Nancy R. Horlacher, The Major David Zeigler Papers, 1791-1822 (Dayton, OH: Dayton & Montgomery County Public Library, 1998), iv. Horlacher, iv; Katzenberger, 5-18; Tolzmann, xiii, 54. Tolzmann, xiii-xiv, 54-55; Horlacher, iv; Katzenberger, 19-32. “Jamestown Births and Deaths,” in James N. Arnold, Vital Records of Rhode Island, 1636-1850, First series: Births, Marriages, and Deaths (Providence, RI: Narragansett Historical Publishing Co., 1891), 26; Woodland Cemetery & Arboretum Interment Database, accessed 20 Dec. 2011, http://www.woodlandcemetery.org. Katzenberger, 33-34; Tolzmann, xiv; Horlacher, iv. Katzenberger, 35-43; Tolzmann, xiv, 55; Horlacher, iv. Katzenberger, 35-43; Tolzmann, xiv; Horlacher, iv. Daniel C. Cooper was born November 20, 1773, in Morris County, New Jersey, the son of George Cooper (1745-1801) and Margaret Lafferty. He was trained as a surveyor and first came to the Miami Valley about 1794. He settled in Dayton permanently in the summer of 1796. Cooper is largely credited with helping to settle a question of property rights in the early days of the city, between 1799 and 1801. He is also credited with attracting many of the important early settlers to Dayton. He also built Dayton’s first mills, served as its first justice of the peace, created a new plat (1809) of the city, and was a member of the town council. He also served several terms in the state legislature and state senate. He died on July 13, 1818, in Dayton, and his remains now lie in Woodland Cemetery. In 1803, Daniel Cooper married Sophia (Greene) Burnet (1779-1826), the young widow of George W. Burnet (1773-1801) of Cincinnati, and daughter of Charles Greene and Phebe Sheffield. Sophia was born August 25, 1779, in East Greenwich, Rhode Island. Daniel and Sophia had several children, but only David Zeigler Cooper (1812-1836) lived to adulthood, though he had no children. After Daniel Cooper’s death in 1818, Sophia in 1822 married General Fielding Loury (1781-1848), with whom she had one child: Fielding Loury, Jr. (1824-1882), who married Elizabeth Richards Morrison (d. 1914). Sophia (Greene) Burnet Cooper Loury died May 17, 1826, and is buried in Woodland Cemetery. Charles Russell Greene was born December 21, 1785, in East Greenwich, Rhode Island, the son of Charles Greene (1753-?) and Phebe Sheffield (1754-?). Sophia (Greene) Burnet Cooper Loury was his older sister, and Joseph Peirce (son of Isaac Peirce and Mary Sheffield) was his cousin. Like his brother-in-law Isaac Peirce, Charles Greene was also a member of the Ohio Company that migrated to Marietta in 1788, and so Charles R. Greene grew up on the Ohio frontier. In 1806, Charles R. Greene came to Dayton, where his brother-in-law Daniel C. Cooper and cousin Joseph Peirce already resided. He went into business with Cooper. 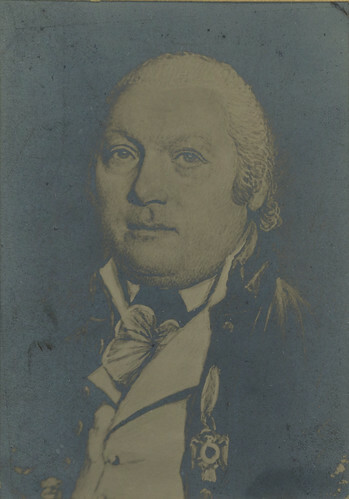 He succeeded Benjamin Van Cleve as Clerk of Courts in 1822, serving in that capacity until his death; he was one of the first bank cashiers and one of the first fire wardens. Charles R. Greene was killed by Matthew Thompson on September 11, 1833, as a result of a dispute. [More information about the Charles R. Greene estate can be found in the Van Cleve-Dover Collection (MS-006) at the Dayton Metro Library. See finding aid.] He is buried in Woodland Cemetery. His wife, Achsah (Disbrow) Greene, and several children survived him. Augustus W. Drury, History of the City of Dayton and Montgomery County, Ohio, (Chicago: Clarke Publishing Co., 1909), 1:97-98, 1:25-233; John F. Edgar, Pioneer Life in Dayton and Vicinity, 1796-1840 (Dayton, OH: United Brethren Publishing House, 1896), 33-40; Robert W. Steele & Mary Davies Steele, Early Dayton (Dayton, OH: United Brethren Publishing House, 1896), 29-31, 61-66, 87; Charlotte Reeve Conover, Dayton, Ohio: An Intimate History (New York: Lewis Historical Publishing Co., 1932), 16-20; Lindsay M. Brien, A Genealogical Index of Pioneers in the Miami Valley, Ohio, 2nd ed. (Dayton, OH: Montgomery County Chapter, Ohio Genealogical Society, 2007), 27. Edgar, Pioneer Life in Dayton, 36-37, 40, 112-113; Steele & Steele, Early Dayton, 87. Edgar, Pioneer Life in Dayton, 120-121; Drury, History of the City of Dayton, 1:130-131; Steele & Steele, Early Dayton, 87-88; Brien, A Genealogical Index of Pioneers in the Miami Valley, Ohio, 2nd ed., 69; “Jamestown Births and Deaths,” in James N. Arnold, Vital Records of Rhode Island, 1636-1850, First series: Births, Marriages, and Deaths (Providence, RI: Narragansett Historical Publishing Co., 1891), 26. The Estate Accounts of Charles R. Greene, 1833, can be found in the Van Cleve-Dover Collection (MS-006), Notebook 10, Dayton Metro Library. The books were in the possession of John W. Van Cleve. James Steele was born October 28, 1778, in Virginia, the son of Robert Steele and Agnes Coulter. Other children of Robert and Agnes Steele who came to Dayton included: Dr. John Steele (1791-1854), a doctor who came to Dayton in 1812; Samuel Steele (d. 1839); and Martha Steele (d. 1813), who married William McClure (d. 1812). In 1788, Robert Steele moved his family from Virginia to Fayette County, Kentucky, near Lexington. About 1805 or 1806, James came to Dayton, Ohio, and went into the merchant business with his brother-in-law William McClure, in the firm of McClure & Steele. On December 2, 1807, James entered into a business partnership with Joseph Peirce (whose sister Phebe he would later marry), as the firm Steele & Peirce. James constructed a brick building on the southeast corner of First and Main Streets, which housed a general store. The pair remained in business together until Joseph’s death in 1821. During the War of 1812, James Steele served as a captain and was ordered to provide protection to citizens in the Ohio towns of Piqua and later St. Mary’s. In November 1812, James Steele married Phebe Peirce (about 1784-1861), daughter of Isaac Peirce and Mary Sheffield. Phebe was born about 1784 in Rhode Island. From 1815 to 1822, James was a director of the Dayton Bank. He became president of the Dayton Bank in 1822, following the death of the previous president (and James’s brother-in-law) Joseph Peirce. James also held the position as bank president until his own death in 1841. James was interested in many aspects of community life. He served for many years as a trustee of the Dayton Academy, as well as a trustee of Miami University. He was also an active supporter of the second building of the First Presbyterian Church, which was completed just before his death in 1841. He was also one of the original stockholders of the Woodland Cemetery Association and served as the Association’s first president. James Steele was also active in civic life, serving as an associate judge of Montgomery County for 14 years; an elector for the state of Ohio during the 1824 presidential election, in which he voted for his friend Henry Clay; and a senator in the Ohio legislature for 4 years, from 1834-1838. James Steele died August 22, 1841, and Phebe (Peirce) Steele died March 11, 1861. They are both buried in Woodland Cemetery, Dayton, Ohio. Joseph Peirce Steele (about 1821-1887). Robert Wilbur Steele was born July 3, 1819, in Dayton, Ohio. He attended the Dayton Academy and Miami University. Robert was very active in many aspects of education in Dayton, including serving as a member of the Board of Education for over 30 years and being one of the incorporators of the Cooper Female Seminary in 1844. He was one of the founders of the Dayton Library Association and served as its director and president for many years. He also served as president of the Woodland Cemetery Association from 1858 until his death. Robert W. Steele was married twice. His first wife was Elizabeth Smith, and they had several children, including daughter Mary Davies Steele (about 1843-1897); his second wife was Clara P. Steele, with whom he had one child. Robert W. Steele died September 24, 1891, and was buried in Woodland Cemetery in Dayton. Joseph Peirce Steele was born about 1821 in Dayton, Ohio. He was never married. He was identified as an “idiot” in the 1850 U.S. Federal Census. He died June 6, 1887, and was buried in Woodland Cemetery in Dayton. Robert W. Steele & Mary Davies Steele, Early Dayton (Dayton, OH: United Brethren Publishing House, 1896), 89, 115; Frank Conover, Centennial Portrait and Biographical Record of the City of Dayton and Montgomery County, Ohio (Chicago: A. W. Bowen, 1897), 175; Montgomery County Genealogical Index, Dayton Metro Library; Lindsay M. Brien, Miami Valley Will Abstracts from the Counties of Miami, Montgomery, Warren, & Preble, in the State of Ohio, 1803-1850 (Dayton, OH: Lindsay M. Brien, 1940), 76; Lindsay M. Brien, A Genealogical Index of Pioneers in the Miami Valley, Ohio, 2nd ed. (Dayton, OH: Montgomery County Chapter, Ohio Genealogical Society, 2007), 186, 124. Sources disagree whether James Steele was born in Rockbridge County (Steele & Steele, Early Dayton, 89) or Rockingham County (Conover, Centennial Portrait, 175). Steele & Steele, Early Dayton, 89; James Steele: McClure & Steele in Account with Samuel and George Trotter, 1806-1807, Forrer-Peirce-Wood Collection (hereafter cited as FPW), 38:12, Dayton Metro Library (Dayton, Ohio). John F. Edgar, Pioneer Life in Dayton and Vicinity, 1796-1840 (Dayton, OH: United Brethren Publishing House, 1896), 116, 134; Steele and Steele, Early Dayton, 89; James Steele: Steele & Peirce, Merchants – Documents and Letters relating to the Business, 1807-1821 [several documents], FPW, 38:14. 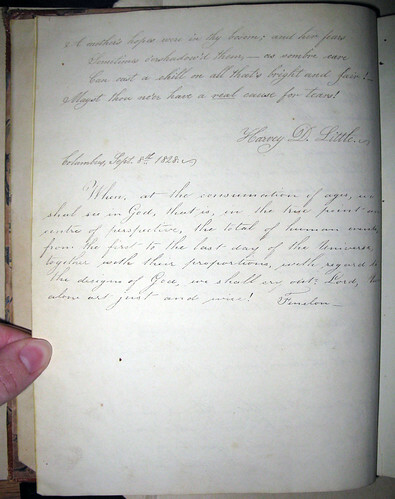 The business documents pertaining to Steele & Peirce includes the articles of co-partnership, dated December 2, 1807. The store remained until the 1860s, when it was removed to make way for the Turner Opera House. Steele & Steele, Early Dayton, 90-91; Edgar, Pioneer Life in Dayton, 135; Conover, Centennial Portrait, 175. Steele & Steele, Early Dayton, 91; Woodland Cemetery & Arboretum Interment Database, accessed 20 Dec. 2011, http://www.woodlandcemetery.org; U.S. Federal Census, 1850. Steele & Steele, Early Dayton, 90; Edgar, Pioneer Life in Dayton and Vicinity, 116. Steele & Steele, Early Dayton, 90; Edgar, Pioneer Life in Dayton, 134-135. Steele & Steele, Early Dayton, 90; Edgar, Pioneer Life in Dayton, 135; Conover, Centennial Portrait, 175. 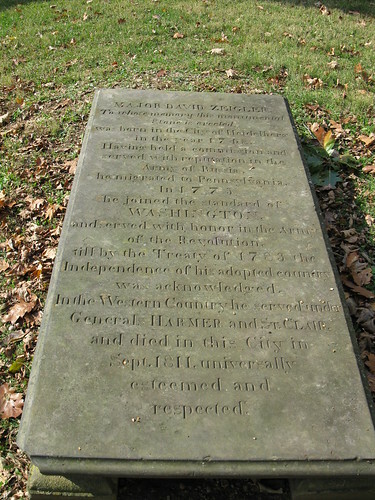 Conover, Centennial Portrait, 175; Woodland Cemetery & Arboretum Interment Database, accessed 20 Dec. 2011, http://www.woodlandcemetery.org. Steele & Steele, Early Dayton, 91-92, 200-201;Edgar, Pioneer Life in Dayton, 135-137; Conover, Centennial Portrait, 175-176; Charlotte Reeve Conover, Some Dayton Saints and Prophets (Dayton, OH: United Brethren Publishing House, 1907), 49-77; Woodland Cemetery & Arboretum Interment Database, accessed 20 Dec. 2011, http://www.woodlandcemetery.org. Steele & Steele, Early Dayton, 91; U.S. Federal Census, 1850; Woodland Cemetery & Arboretum Interment Database, accessed 20 Dec. 2011, http://www.woodlandcemetery.org. John Elliot was born in New York, probably sometime around 1760 or perhaps earlier. During the American Revolution, John served as a surgeon’s mate in a New York regiment until he was discharged at the end of the war in 1783. 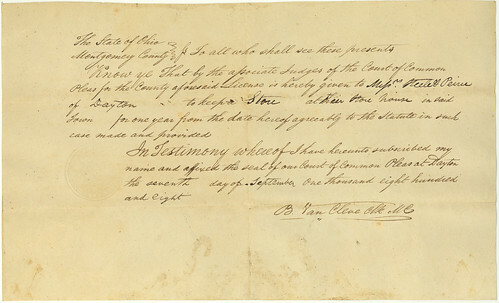 After the Revolutionary War ended, John Elliot was commissioned, in a document signed by George Washington, as a surgeon in the United States Army. He served in the west under Arthur St. Clair and Anthony Wayne. He was stationed for a time at Fort Washington, near Cincinnati, and he served with Wayne in the campaigns of 1794-1795, which resulted in the Treaty of Greenville. John was mustered out with the rest of his regiment, being honorably discharged on June 1, 1802. In that same year, 1802, Dr. John Elliot came to Dayton, Ohio, to reside, becoming the second physician to make his permanent residence in the Dayton vicinity—Dr. John Hole had arrived earlier in Washington Township—and the first physician in Dayton proper. In addition to being the first doctor in Dayton, Dr. John Elliot was instrumental in forming the Dayton Social Library Association in 1805. This association was the first library authorized by the state legislature. Dr. Elliot was quite popular in Dayton, both socially and professionally. Julia Ann Elliot was born in February 1790. Henrietta Eliza Elliot was born in June 1792. After the death of their mother, Julia and Henrietta went to live with Mrs. Jeremiah Hunt, of Cincinnati, who raised the girls along with her own family. The Hunts were family friends of the Elliots. The Hunt brothers—Jeremiah, Jesse, and Abijah—were merchants as well as sutlers (merchants who sold provisions to soldiers in the army), so perhaps Dr. Elliot met them when he was stationed at Fort Washington, in Cincinnati. By 1805, the girls seem to have been residing with the family of Jesse Hunt, Jeremiah’s brother. This may have resulted when Jeremiah Hunt moved to Natchez, Mississippi, temporarily joining his brother Abijah there. 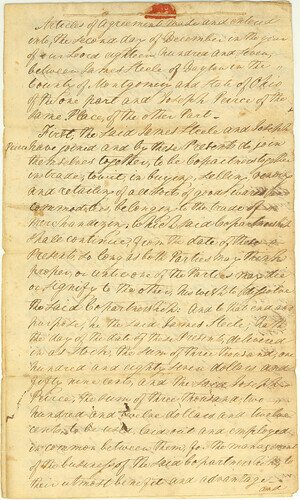 In 1805, John Elliot addressed a letter to his daughter Julia “at Mr. Jesse Hunt’s, Cincinnati,” and in it, he instructed her to “pay the utmost respect to all Mrs. Hunt says to you.” A few years later, when Dr. Elliot died, the letter sent to inform his daughters of his death was also addressed to Jesse Hunt. 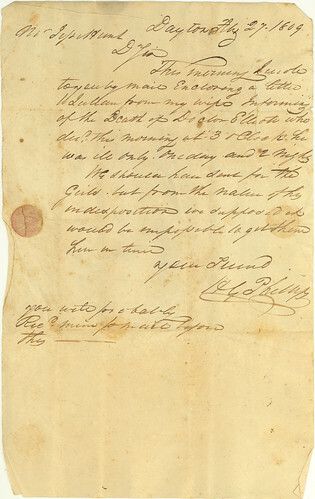 Several letters from Dr. Elliot to his daughter Henrietta, between 1806 and 1808, instruct her to attend her studies and to respect and obey “Mrs. Symmes,” although the specific identity and role of Mrs. Symmes is not clear. Dr. Elliot was buried with military honors on February 28, 1809, including a military procession from his home on Water Street (Monument Avenue) to the Old Burial Ground on Sixth Street. His remains were later moved to Woodland Cemetery. Julia Ann Elliot, sometimes called Julianna, was born in February 1790 in Vincennes, Indiana. On July 16, 1809, at Cincinnati, she married Joseph Halsey Crane. Joseph H. Crane was born in Elizabethtown, New Jersey, August 31, 1782, and moved to Dayton, Ohio, about 1804. He was a Dayton lawyer and a state representative around the time of his marriage; he would later be a U.S. Congressman and a judge. He also fought in the War of 1812. Julia and Joseph Crane had twelve children, most of whom died as children, but two of their sons grew up and became lawyers: Joseph G. Crane and William Crane. Judge Joseph H. Crane died November 13, 1851, and Julia (Elliot) Crane died February 25, 1861. They are both buried in Woodland Cemetery in Dayton, Ohio. Henrietta Eliza Elliot, sometimes called Harriet, was born in June 1792 in Vincennes, Indiana. On November 10, 1810, she married Joseph Peirce (1786-1821), a Dayton merchant. They had five children: Mary Ann Peirce, who married Edward W. Davies; David Zeigler Peirce; James S. Peirce; Jeremiah Hunt Peirce; and Joseph Crane Peirce. 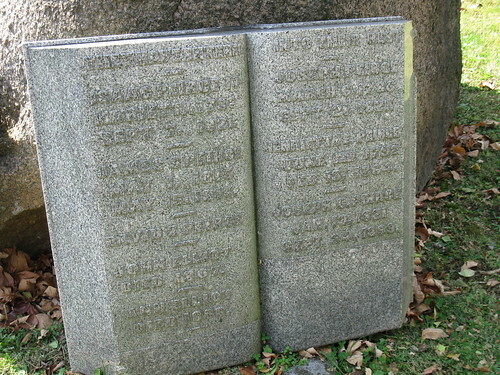 Joseph Peirce died on September 27, 1821, and Henrietta (Elliot) Peirce died on February 13, 1864. They are both buried in Woodland Cemetery in Dayton. W. J. Conklin, Pioneer Doctor: A Medical Sketch of Dayton, 1796-1825 (Dayton, OH: United Brethren Publishing House, 1900), accessed 19 Mar. 2012, http://www.daytonhistorybooks.com/page/page/1558641.htm; New York in the Revolution as a Colony and State (Albany, NY: J. B. Lyon Co., 1904), 1:40; Harvey E. Brown, “Register of Medical Officers who Served to the Close of the Revolution and were Discharged in 1783,” in Historical Notes Concerning the Medical Department of the United States Army (Washington, DC: Surgeon General’s Office, 1873), accessed 19 Mar. 2012, http://history.amedd.army.mil/booksdocs/medicaldepartment/appendixa.html. Brown lists “John Elliot” as a surgeon’s mate in the First New York Regiment; New York in the Revolution lists “John Elliot, Jr.,” as a surgeon’s mate in the Third New York regiment. Conklin, Pioneer Doctor; Ohio Adjutant General’s Office, and Daughters of the American Revolution, The Official Roster of the Soldiers of the American Revolution Buried in the State of Ohio (Columbus, Ohio: F.J. Heer Printing Co., 1929-1959), 1:125; Obituary of John Elliot, Dayton Repertory, 1 Mar. 1809, in FPW, 38:4; Harvey W. Crew, History of Dayton, Ohio (Dayton, OH: United Brethren Publishing House, 1889), 91-92; Howard Burba, “The Night They Dedicated the Library,” Dayton Daily News, 6 May 1934, accessed 19 Mar. 2012, http://www.daytonhistorybooks.com/library.html. Conklin, Pioneer Doctor; Crew, History of Dayton, 92; Memoirs of the Miami Valley (Chicago: Robert O. Law Co., 1919), 2:179; John F. Edgar, Pioneer Life in Dayton and Vicinity, 1796-1840 (Dayton, OH: United Brethren Publishing House, 1896), 143. Conklin, Pioneer Doctor; Sarah Schenck Crane, The Crane Family History (Cincinnati, OH: Ebert & Richardson Co., 1911), 55. Crane, The Crane Family History, 55-56. Andy McMillion, “The Hunt Family of Jefferson County, MS: Genealogy and History,” accessed 20 Mar. 2012, http://jeffersoncountyms.org/hunt_family.htm; Cincinnati: The Queen City, 1788-1912 (Chicago & Cincinnati: S. J. Clarke Publishing Co., 1912), 483. 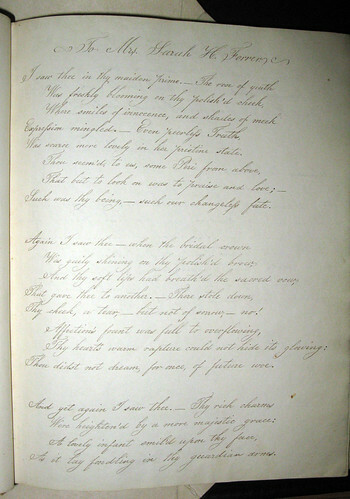 John Elliot to Julia Elliot, 15 Dec. 1805, FPW, 38:1. H. G. Phillips to Jesse Hunt, 27 Feb. 1809, FPW, 38:3. John Elliot to Henrietta Elliot, 1806-1808 [several letters], FPW, 38:2. John Elliot: Funeral invitation and obituary, FPW, 38:4; Conklin, Pioneer Doctor; Crew, History of Dayton, 92; Woodland Cemetery tombstone inscriptions. John Elliot is not listed in the Woodland Cemetery & Arboretum Interment Database. Crane, The Crane Family History, 20-25, 55-56; Edgar, Pioneer Life in Dayton, 92-94; “Joseph Halsey Crane,” Biographical Directory of the United States Congress, 1774-Present, accessed 19 Mar. 2012, http://bioguide.congress.gov/scripts/biodisplay.pl?index=C000872; “Joseph Halsey Crane,” Wikipedia, last modified 17 Mar. 2012, http://en.wikipedia.org/wiki/Joseph_Halsey_Crane; Woodland Cemetery & Arboretum Interment Database, accessed 20 Dec. 2011, http://www.woodlandcemetery.org. Crane, The Crane Family History, 55-56; Harvey W. Crew, History of Dayton, Ohio (Dayton, OH: United Brethren Publishing House, 1889), 143; Edgar, Pioneer Life in Dayton and Vicinity, 116; Woodland Cemetery & Arboretum Interment Database, accessed 20 Dec. 2011, http://www.woodlandcemetery.org. See also Series III, Subseries 3: Joseph Peirce Family. Joseph Peirce was born March 6, 1786, in Newport, Rhode Island, the son of Isaac Peirce (1749-1821) and Mary Sheffield (1757-?). The other children of Isaac and Mary Peirce were: Phebe Peirce, who married James Steele; Samuel Peirce; Lucy Peirce; Elizabeth Peirce; and Eliza Peirce. Joseph’s father Isaac Peirce was a Revolutionary War veteran, having served in 1779 as an aide-de-camp to General Horatio Gates. Isaac was a shareholder in the Ohio Company and migrated with his family to Marietta, Ohio, in 1788, then became one of the founders of nearby Belpre, Ohio, in 1789. Isaac eventually moved to Dayton, Ohio, after his son Joseph, and died there on August 28, 1821. Joseph Peirce spent several years of his childhood living in the stockade at Belpre during the Indian Wars. He received a good education even on the frontier, because the Ohio Company had brought excellent teachers with them. In 1805, at the age of 19, Joseph Peirce moved to Dayton, Ohio, apparently at the urging of Daniel C. Cooper, who has been credited with influencing many of Dayton’s earliest important settlers to the town between 1804 and 1808. Joseph’s cousin Charles Russell Greene was another who came to Dayton at Cooper’s urging, about 1804 or 1805. Joseph’s and Charles’s mothers were sisters, and their fathers had both been shareholders in the Ohio Company. On December 2, 1807, Joseph entered into a business partnership with James Steele (who would later marry Joseph’s sister Phebe). The firm of Steele & Peirce sold general merchandise, and the pair remained in business together until Joseph’s death. On November 10, 1810, Joseph Peirce married Henrietta Eliza Elliot (1792-1864), sometimes called Harriet, daughter of Dr. John Elliot. Henrietta was born in June 1792 in Vincennes, Indiana. In 1812, Joseph Peirce served on the Ohio legislature. In 1813, he was elected a trustee of the newly established Dayton Bank, and in 1814, he became its president, a position he held until his death. Joseph Peirce died on September 27, 1821, at the age of only 35 years, as a result of a fever which swept through Dayton, taking the lives of several other residents as well. He was buried in Woodland Cemetery in Dayton. Henrietta (Elliot) Peirce died on February 13, 1864, probably in Dayton, Ohio, and was buried in Woodland Cemetery in Dayton. 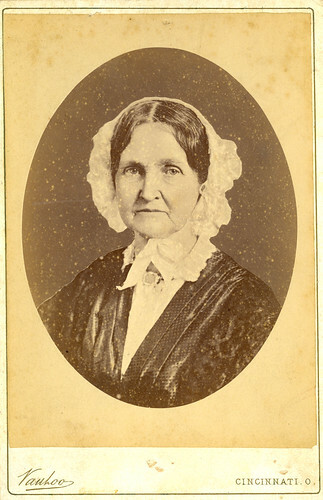 Mary Ann Peirce was born in September 1811 in Dayton, Ohio. On November 24, 1829, in Montgomery County, Ohio, she married Edward Watts Davies (1802-1873). They had several children, including: Eliza Peirce Davies, who married Joseph Dart; Samuel Watts Davies, who married Eliza P. Howard; Lucy Z. Davies; Joseph Peirce Davies, who married Louie Phillips; Julia Crane Davies, who married Robert C. Schenck. Mary Ann (Peirce) Davies died September 24, 1880, and was buried in Woodland Cemetery in Dayton, Ohio. David Zeigler Peirce was born about 1813 in Dayton, Ohio. On December 15, 1842, in Montgomery County, Ohio, he married Eliza Johnston Greene (1821-1885), daughter of Charles Russell Greene and Achsah Disbrow. David died August 17, 1843, and was buried in Woodland Cemetery in Dayton, Ohio. James S. Peirce was born May 1, 1815, probably in Dayton, Ohio. He died May 15, 1816, and was buried in Woodland Cemetery in Dayton, Ohio. Jeremiah Hunt Peirce was born September 8, 1818, in Dayton, Ohio. On June 9, 1846, in Dayton, Jeremiah Hunt Peirce married Elizabeth Hannah Forrer (1827-1874), daughter of Samuel Forrer and Sarah Howard. They had eight children: Samuel Forrer Peirce; Henrietta Elliot Peirce, who married Henry Eugene Parrott; Edward Davies Peirce; Sarah Howard Peirce; Mary Forrer “Mellie” Peirce; Elizabeth Forrer Peirce; John Elliot Peirce, who married Mary Frances Harsh; and Howard Forrer Peirce. J. H. Peirce married Mary Forrer as his second wife. Jeremiah H. Peirce died on May 6, 1889, in Dayton, Ohio, and was buried in Woodland Cemetery. Joseph Crane Peirce was born January 13, 1821, in Dayton, Ohio. On December 23, 1856, in Montgomery County, Ohio, he married Louise Smith. They had no children. Joseph C. Peirce died September 24, 1899, and was buried in Woodland Cemetery in Dayton, Ohio. Harvey W. Crew, History of Dayton, Ohio (Dayton, OH: United Brethren Publishing House, 1889), 143; John F. Edgar, Pioneer Life in Dayton and Vicinity, 1796-1840 (Dayton, OH: United Brethren Publishing House, 1896), 116; Robert W. Steele and Mary Davies Steele, Early Dayton (Dayton, OH: United Brethren Publishing House, 1896), 80; Ohio Adjutant General’s Office, and Daughters of the American Revolution, The Official Roster of the Soldiers of the American Revolution Buried in the State of Ohio (Columbus, Ohio: F.J. Heer Printing Co., 1929-1959); Woodland Cemetery & Arboretum Interment Database, accessed 20 Dec. 2011, http://www.woodlandcemetery.org; “Jamestown Births and Deaths,” in James N. Arnold, Vital Records of Rhode Island, 1636-1850, First series: Births, Marriages, and Deaths (Providence, RI: Narragansett Historical Publishing Co., 1891), 26. Crew, History of Dayton, 143; Steele and Steele, Early Dayton, 80; Woodland Cemetery & Arboretum Interment Database, accessed 20 Dec. 2011, http://www.woodlandcemetery.org. Steele and Steele, Early Dayton, 80, 88. Steele and Steele, Early Dayton, 80, 87-88; Edgar, Pioneer Life in Dayton and Vicinity, 116; Roz Young, “Dayton Final Resting Place for Cincinnati’s First Mayor,” Dayton Daily News, 20 Aug. 1994, accessed 14 Mar. 2012, http://www.daytonhistorybooks.com/youngdanielcooper.htm. See also Series III, Subseries 6: Cooper/Greene Family. Crew, History of Dayton, 143; Edgar, Pioneer Life in Dayton and Vicinity, 116; Steele and Steele, Early Dayton, 80. Business documents pertaining to Steele & Peirce can be found in Series III, Subseries 5: Steele Family. The articles of co-partnership, dated December 2, 1807, can be found in Box 38, Folder 14. Crew, History of Dayton, 143; Edgar, Pioneer Life in Dayton and Vicinity, 116; Woodland Cemetery & Arboretum Interment Database, accessed 20 Dec. 2011, http://www.woodlandcemetery.org. See also Series III, Subseries 4: Elliot Family. Crew, History of Dayton, 143; Edgar, Pioneer Life in Dayton and Vicinity, 116. Crew, History of Dayton, 143; Steele and Steele, Early Dayton, 81. Woodland Cemetery & Arboretum Interment Database, accessed 20 Dec. 2011, http://www.woodlandcemetery.org. Edgar, Pioneer Life in Dayton and Vicinity, 211-212; Ohio, County Marriages, 1790-1950 (database), FamilySearch, accessed 25 Jan. 2012, http://www.familysearch.org; Woodland Cemetery & Arboretum Interment Database, accessed 20 Dec. 2011, http://www.woodlandcemetery.org. Edgar, Pioneer Life in Dayton and Vicinity, 116; Ohio, County Marriages, 1790-1950 (database), FamilySearch, accessed 19 Mar. 2012, http://www.familysearch.org; Woodland Cemetery & Arboretum Interment Database, accessed 20 Dec. 2011, http://www.woodlandcemetery.org. Frank Bruen, Christian Forrer, the Clockmaker, and his Descendants (Rutland, VT: Tuttle, 1939), 106-129; Edgar, Pioneer Life in Dayton and Vicinity, 116-117; Woodland Cemetery & Arboretum Interment Database, accessed 20 Dec. 2011, http://www.woodlandcemetery.org. See also FPW, Series II: Jeremiah H. Peirce Family. Edgar, Pioneer Life in Dayton and Vicinity, 116-117; County Marriages, 1790-1950 (database), FamilySearch, accessed 19 Mar. 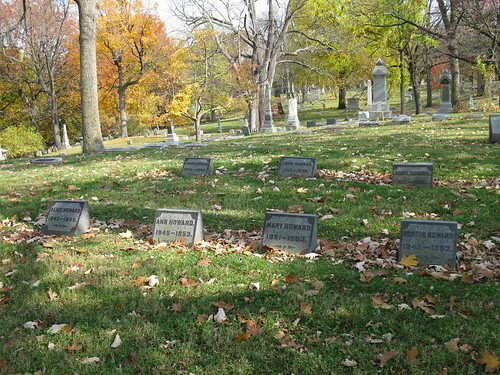 2012, http://www.familysearch.org; Woodland Cemetery & Arboretum Interment Database, accessed 20 Dec. 2011, http://www.woodlandcemetery.org. John H. Howard was born October 5, 1813, in Belmont County, Ohio, the son of Horton Howard (1770-1833) and his third wife Hannah Hastings (1774-1833). Beginning in 1832, John attended Kenyon College in Gambier, Ohio. He first attended the grammar school for the year 1832-1833. He entered the sophomore college class in 1834. While at Kenyon, he was a member of the prominent literary society, the Philomathesian Society. John graduated from Kenyon College with an A.B. degree in 1837. John moved to Dayton, Ohio, in 1839, and read law in the office of Odlin & Schenck. He was admitted to the bar in 1840. John was a lawyer in Dayton for nearly 40 years, several of which he practiced with Daniel A. Haynes in the firm Haynes & Howard, one of the best firms in the state. In later years, he practiced law with his son William, first as John Howard & Son, then as Howard & Howard. John served as mayor of Dayton from 1848-1854. 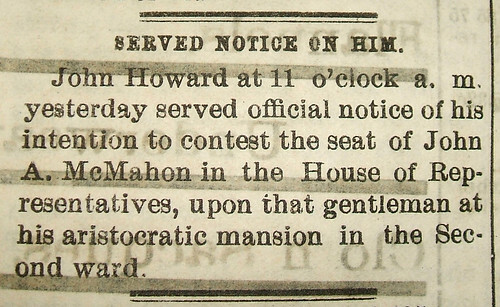 In the 1876 election, John ran as a Republican candidate for U.S. Congress from Ohio’s 4th district, losing by less than 100 votes to the Democratic candidate John McMahon. On June 21, 1841, in Hamilton County, Ohio, John married Ann E. Loury, daughter of Fielding Loury, Sr. Ann was born about 1818 or 1819 in Troy, Ohio. John H. Howard died on May 8, 1878, in Dayton, Ohio. His wife Ann died September 14, 1886. They are both buried in Woodland Cemetery in Dayton, Ohio. William Crane Howard was born April 24, 1842, in Dayton, Ohio. From August 1862 until April 1863, William served as a second lieutenant in the 17th Independent Battery Ohio Volunteer Light Artillery. [For more on William’s Civil War service, see “A Tale of Two Howards,” especially Part 5, here on my blog.] He studied law with his father, and the two practiced law together from 1864 until John’s death in 1878. On December 5, 1865, in Montgomery County, Ohio, William married Anna Keifer (about 1843-1879). 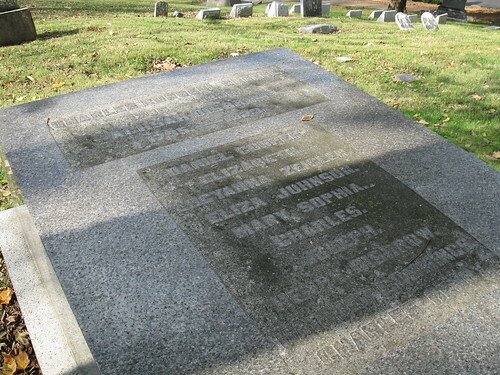 They had four children: Eliza K. Howard, Ann E. Howard, Louise Howard, and John H. Howard. Shortly after the death of his wife in 1879, William moved, with his children and his widowed mother, to the Cincinnati area, where he was a U.S. Clerk. He later moved to the San Francisco, California, area, where he died October 30, 1900. William was buried next to his parents and siblings in Woodland Cemetery in Dayton, Ohio. Eliza P. Howard was born about 1844 in Dayton, Ohio. On May 18, 1871, Eliza married Samuel Watts Davies (1838-1919), son of Edward Watts Davies and Mary Ann Peirce. They had three children: Mary D. Davies, Edward Watts Davies, and John Howard Davies. Eliza P. (Howard) Davies died May 9, 1884, and was buried in Woodland Cemetery in Dayton. 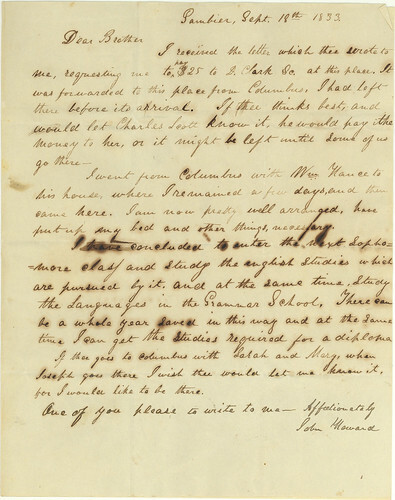 Several letters from the time period of the August 1833 cholera outbreak are addressed to John at Gambier, Ohio. Also, according to Kenyon College historian Tom Stamp, it was not unusual for a young man of John’s age (19 or 20) to enter the grammar school at Kenyon, during that time period. Personal correspondence from Lydia Shahan, special collections assistant, Greenslade Special Collections & Archives, Kenyon College, Gambier, Ohio, 19 Mar. 2012. John Edgar, in Pioneer Life in Dayton and Vicinity (1896), p. 113, incorrectly states that John graduated in 1839. Edgar, Pioneer Life in Dayton, 113; David C. Greer, Sluff of History’s Boot Soles: An Anecdotal History of Dayton’s Bench and Bar (Wilmington, OH: Orange Frazer Press, 1996), 75; Dayton City Directories. “Mayors of Dayton” List, Dayton Metro Library Local History Question & Answer File; Greer, Sluff of History’s Boot Soles, 75; “How Soldiers Voted in Ohio: Why a Democrat was Elected to Congress from a Republican District,” 21 Oct. 1876, Cincinnati Enquirer, ProQuest Historical Newspapers: The Cincinnati Enquirer, 1841-1922; Dayton Journal, Aug.-Oct. 1876 [several articles]. Ohio, County Marriages, 1790-1950 (database), FamilySearch, accessed 25 Jan. 2012, http://www.familysearch.org; Edgar, Pioneer Life in Dayton, 112-113; U.S. Federal Census, 1860; Woodland Cemetery & Arboretum Interment Database, accessed 26 Oct. 2011, http://www.woodlandcemetery.org. 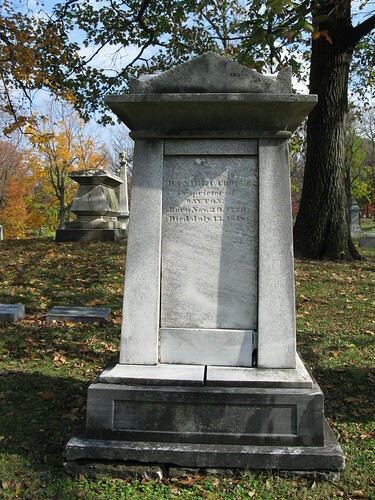 Obituaries of John Howard, 10 May 1878 and 11 May 1878, Dayton Daily Journal; obituary of Ann E. Howard, 15 Sept. 1886, Dayton Daily Journal; Woodland Cemetery & Arboretum Interment Database, accessed 26 Oct. 2011, http://www.woodlandcemetery.org. John and Ann Howard are buried in Section 66, Lot 125. Official Roster of the Soldiers of the State of Ohio in the War of the Rebellion, 1861-1866, vol. X (Akron: Werner Co., 1889), 583; Civil War Draft Registration Records, 1863-1865 (database), Ancestry Library Edition; Dayton City Directories; U.S. Federal Census, 1850-1900; Great Registers of California, 1866-1898 (database), Ancestry Library Edition; Obituary of William C. Howard, , in James O. Oliver scrapbook, Vol. II, Part 2, page 180, Montgomery County Historical Society Collection, Dayton Metro Library, Dayton, Ohio; Woodland Cemetery & Arboretum Interment Database, accessed 26 Oct. 2011, http://www.woodlandcemetery.org. William is buried in Section 66, Lot 127. U.S. Federal Census, 1850-1880; Augustus W. Drury, History of the City of Dayton and Montgomery County, Ohio (Chicago: S. J. Clarke Publishing Co., 1909), 2:84-87; Ohio Marriages, 1800-1958 (database), FamilySearch, accessed 12 Mar. 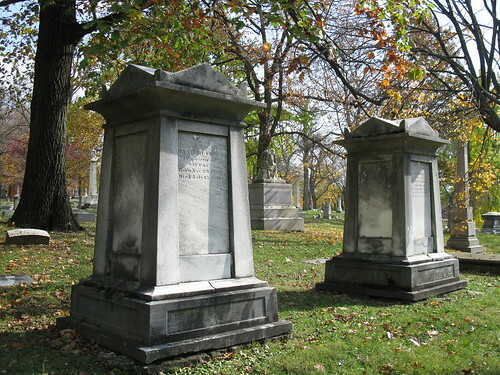 2012, http://www.familysearch.org; Ohio Births & Christenings Index, 1800-1962 (database), Ancestry Library Edition; Woodland Cemetery & Arboretum Interment Database, accessed 26 Oct. 2011, http://www.woodlandcemetery.org. Eliza is buried in Section 66, Lot 127; her husband was later buried beside her. 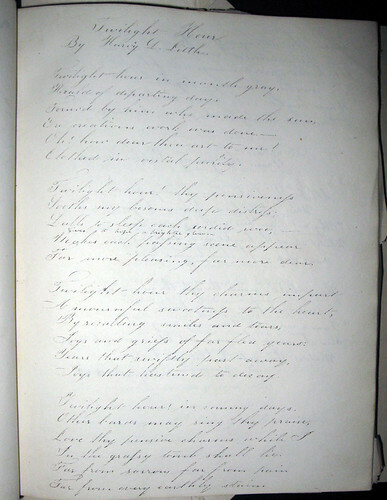 All of these poems are from Sarah (Howard) Forrer‘s Album of “Original and Selected Pieces” of Poetry & Miscellany (Box 5, Folder 5), Forrer-Peirce-Wood Collection (MS-018), Dayton Metro Library (Dayton, Ohio). 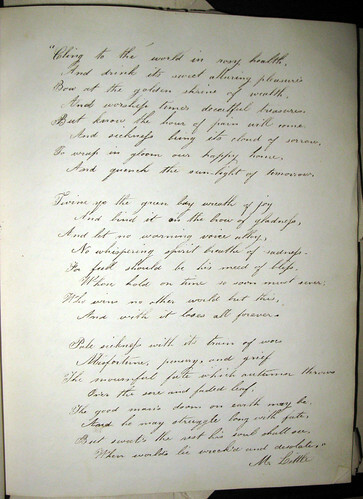 This first one, Harvey wrote for his sister-in-law Sarah (Howard) Forrer, shortly after her marriage (1826) and the birth of her first child (Elizabeth, in 1827). 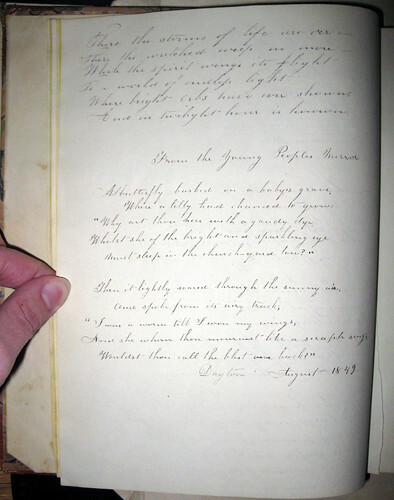 I believe this poem was written in Harvey’s own handwriting, based on a few of his letters (also in the collection). Was scarce more lovely in her pristine state. Such was thy being,– such our changless fate. Thy cheek, a tear,– but not of sorrow,– no! Thou didst not dream, for once, of future woe. As it lay fondling in thy guardian arms. Mayst thou ne’er have a real cause for tears! I think the handwriting on this one may be Sarah’s. It’s a little hard to tell. Oh! how dear thou art to me! Far more pleasing, far more dear. Joys that hastened to decay. In the grassy tomb shall lie. Far from every earthly stain. And in twilight hour is known. I just love this one; it has a good rhythm, and I admit, I’ve always preferred poems that rhyme. In a way, it’s almost eerie, knowing as I do that within a few short years of writing it, the poet himself “In the grassy tomb shall lie. / Far from sorrow far from pain / Far from every earthly stain.” Harvey was taken by cholera in 1833 at the age of 30. This last poem I want to share is signed “M. Little,” which I’m pretty sure is Harvey’s wife Mary (Howard) Little. It doesn’t say “by” M. Little, but I can’t find this poem anywhere. So I’m not sure whether Mary wrote it herself or if it was simply one that she liked and requested to copy it into Sarah’s album. I believe the original handwriting is Mary’s, based on other examples and letters written by Mary. And worship time’s deceitful treasures. And quench the sunlight of tomorrow. No whispering spirit breathe of sadness. And with it loses all forever. When worlds lie wreck’d and desolate. Another somewhat gloomy poem, but again, I like it. It’s undated, so I have to wonder whether Mary copied this poem down before or after all the sadness that befell her little – er, Little – family. In the summer of 1833, Mary lost her husband, two children, and both her parents in a cholera epidemic; the following spring, she lost her remaining two children to scarlet fever. She would eventually marry again and have 4 more children (one of whom died in the Civil War, but the other 3 grew to old age). I’m sure there were plenty of happy times in her life, too, but when I think of Mary (Howard) Little Affleck, I remember a woman who endured many, many sorrows.